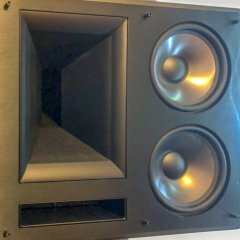 I have owned about 7 Emotiva amps over the years and they are very good for the money. Can’t believe this hasn’t been asked yet.. How large is the room? In a small room, with everything crossed over around 80hz (dual 12” subs) I don’t think you would even notice a difference between amp vs. receiver, driving the speakers. Been there and done that many times. I like the additional lights in my rack and the knowledge that the system is overbuilt, vs wondering if I am maximizing my $$$/performance ratio. But so am s but of a nut, when it comes to my HT gear. That Denon is a stout unit and has more power than most home theater receivers, so unless you are watching action movies at extreme levels, it shouldn’t need an external amp. Also so check out the Monolith line of amps. This is the direction I am going to go next, if I ever get a dedicated room. I always think putting money towards quality subs it the most impactful change you can make in the system. My second change would be to bump your center up to the 450, if you have the room for it. Sorry, CNN, Fox News, MSNBC? Haha I am not the type to jump conclusions so I also don’t believe this is arson or a terrorist attack either. Construction accidents happen all the time, especially in buildings that are perpetually under construction. There are literally millions of other places you could donate your money and I encourage you to do so as you see fit. I actually see the significance structures like this have on communities and the positive role they play in bringing people of all walks of life together. I donate other places but I will be pitching in something here also. If I donated to every charity or person in need out there, I would quickly turn into one of those in need. What good would that do anyone? Again, donate how you see fit but others should do the same. It’s rumored that $450,000,000 has already been raised for the rehabilitation. I would sure pitch in something, to help preserve this piece of human accomplishment/history. Crazy how how these types of tragedies can bring everyone together. Also a shame it takes something like this, to unite people in this day and age. That was so much fun to watch. Not too proud to mention that I got a little misty, when he was hugging his kids. Tiger was a big reason I decided to pick up golf clubs in the first place. I’ve wanted to have a nerd cabinet, where I display movie collectibles and Sideshow figures. I will likely save one of the shelves for some toys from my childhood, like Star Wars, He Man, Thundercats etc. USNRET, that is exactly what my brother said when he saw it. Haha! He wanted me to stand inside it with the light on and snap a pic but I was afraid I night break the base. I wouldn't object if it came with the ability to beam up a specimen like her, that’s for sure..
That is an awesome looking center speaker! What size are those woofers, so I can get an idea of scale. I used to own a Theater i, which was an awesome center. The center you bought appears to be much larger and higher end than the Theater. Congrats, on the new addition! K5SS replied to W27's topic in Alerts! Sounds like ramblings or a delusional madman to me. There’s an *** for every seat, right? This ad/sale will put that theory to the test. I would love to point you to the thread but I haven’t been able to locate it for quite some time now. The only reason I was able to share that info because I found it so helpful, I copied it to my notes section on my phone, in case I ever needed to reference it again. I also wanted to be able to share it easily, if I thought it would help someone here. I was experiencing the same issue when I ran Audyssey XT32. This is stolen from AVS but this is the advice that gave me the best results: Raise the crossover settings to 80Hz. 3. Use of the Subwoofer Level Adjust Setting is NOT recommended as it is actually over boosting your sub. Rather instead using the Speakers - Manual Setup - Test Tones - Subwoofer setting to boost the sub +5db (that is unless the initial Manual Setup setting is -12db, in which case you'll need to lower the gain on the SVS sub to about 9 o'clock (25%) and run Audyssey again). Refer to the Audyssey Setup/FAQ Guide in the Audyssey sticky thread as well as the 2015 Denon AVR Owner's thread (posts 1-8) for more helpful information. Or is it a 1LE? That’s some shady business practices right there. This would get more exposure over on avsforum.com. If it happened to you, you probably aren’t alone so I am sure others would chime in. Help me pick a receiver please!!!!!!!!!! !